Composed of graduates of the prestigious St. Petersburg Conservatory, they regularly perform in the most important festivals in Russia, Germany, France, Italy, Malta, Englad, Switzerland and Finland. Their varied repertoire, ranging from Russian music of the 19th and early 20th centuries to contemporary composers, is enthusiastically enjoyed by a wide range of audiences and now you can hear them in Nevada! Present members are Mikhail Bondarev (violin), Ekaterina Belisova (violin), Alexi Popov (viola) and Anton Andreev (cello). Sunday, March 17 at 4:00PM at St. Peter’s Episcopal Church in Carson City. The Carson City Symphony Association is working on a special project in March involving some very fine Russian performers, the Rimsky-Korsakov String Quartet from St. Petersburg, Russia. 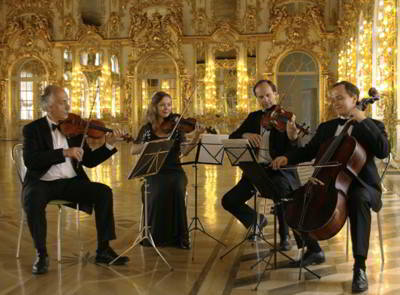 The Rimsky-Korsakov String Quartet, formed in 1939, is a monument of Russian musical history. Composed of four graduates from the prestigious St. Petersburg Conservatory, they regularly perform in the most reputable festivals in Russia, Germany, France, Italy, Malta, England, Switzerland and Finland. Their varied repertoire, ranging from Russian music of the 19th and early 20th centuries to contemporary composers, is enthusiastically enjoyed by a wide range of audiences.